Mittens is a debonair boy, ready for any event in his custom-made tuxedo, neatly accessorized with four white paws. Mittens was born on Halloween, which makes him extra special. 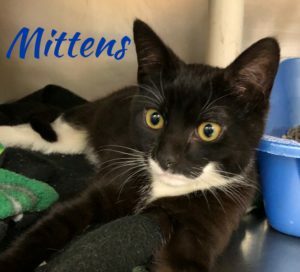 Mittens came to Last Hope from the Town of Brookhaven Animal Shelter, and he is now ready to be scooped up by a lucky someone. Come meet darling Mittens let him make you completely happy!